No. 7 Florida Gators basketball participated in its final tune-up for the 2014-15 season when it faced the Barry Buccaneers in an exhibition game on Thursday evening at the Stephen C. O’Connell Center in Gainesville, Florida. The Gators took down the Bucs 79-70, winning their 24th exhibition opener in a row and improving to 38-2-1 in such games under Donovan. It was over when: With less than 90 seconds remaining, freshman point guard Chris Chiozza found redshirt junior guard Eli Carter in the corner for a wide-open three-pointer that put the Gators up 13. Carter drained it with ease and finished with a game-high 21 points on 7-of-12 shooting, draining 5-of-9 attempts from beyond the arc. Chiozza dished three assists and did not commit a single turnover in 14 minutes. Prominent player: Redshirt junior forward Dorian Finney-Smith was the most consistent and effective player on the court for Florida, posting a double-double with 16 points and 10 rebounds while hitting 5-of-10 shots from the field, 3-of-5 from beyond the arc and 3-of-4 at the charity stripe. First half focus: Carter and junior G Michael Frazier II combined to start 8-for-10 from the field and 5-for-7 from beyond the arc, totaling 23 points for the Gators in the early going. A 20-4 run, including 11-straight points, put Florida ahead 29-12 midway through the half, but a 16-4 Barry surge cut UF’s advantage to six points with less than four minutes to play until the break. Bad shots coupled with lackluster defense allowed the Bucs to get back in the game, but the Gators ended the half on a 10-2 stretch (including a third Frazier triple) to enter the locker rooms up 14. Frazier would go on to miss eight of his last nine treys in the game and finish with 15 points on 5-of-14 shooting (3-for-12 from three). Perfect play: Leading by 10 with less than four minutes to play, Chiozza found classmate and five-star F Devin Robinson for an alley-oop. On the ensuing inbounds pass, Chiozza stole the ball and scored an uncontested layup to put Florida up 14. Robinson played 17 minutes struggled mightily during the contest, finishing 2-for-10 from the field and 1-for-6 beyond the arc after missing his first eight shots (five threes) of the game. Standout stat: Despite owning the rebounding advantage at the break, the Gators were beaten off the glass by the Buccaneers in the second half. Barry left with a 42-39 advantage on the boards, though the teams evened out with 13 offensive rebounds each. 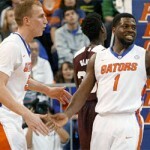 The Bucs also outscored the Gators in the paint (22-18) and on second chances (15-13). 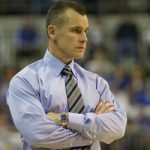 What it means: Head coach Billy Donovan often balks at his team’s preseason top 10 rankings, and though he had not yet done that this offseason, he likely will after Thursday’s exhibition game. The Gators rushed shots, played poor defense and did not give consistent effort throughout the contest, especially in the paint (despite being undersized with sophomore F Chris Walker serving his first of a three-game suspension). Next up: Florida has just over a week to piece things together before it opens the 2014-15 regular season against William & Mary on Friday, Nov. 14 at 7 p.m. in the O’Dome. Life is hard without Scottie Wilbekin. This team has a long way to go and a short time to get there. The number 7 ranking is a vote of respect for Donovan. This team is not the seventh best in the country. We may or may not be the 7th best team in the country, but I disagree with your reason why. While 4 starters left, there is still a lot of experience on this team and a lot of new talent that couldn’t play last year or wasn’t here. This was the first game and an exhibition at that which gave the opportunity to try different lineups, give some PT to people see what works, etc. Most of the other teams are at about the same level the Gators are in terms of preparation, with some a step ahead because of the international travel they can do once every 4 years to get the extra practice in. I doubt that this team is really as far off as it seemed last night and has plenty of upside. Last year’s team was tough. Unfortunately, that’s unusual for us. We’re usually talented but soft. Hopefully this bunch isn’t as soft as they sound, but getting outrebounded by Barry isn’t a good sign. FUN FACT: Last years Final Four team gave up 88 points in their exhibition game. There is nothing to take from this game, other than the new guys got some solid playing time. Agreed. I can’t wait until they implement it into regular season games as well. We will see Barry again on the other side of the Final Four bracket next year. Next time they will be ready though so we better bring our A game.